Offering SomaVeda® Thai Yoga, Ayurveda and Yoga Therapy in the West Palm Beach, Florida area! Offering SomaVeda® Thai Yoga, Ayurveda and Yoga Therapy in the Romeo, Michigan area! Offering Traditional Healing Services and therapy in the Pomona, CA area! Basic Practice Description: Aachan, Anthony James is Founder of the SomaVeda College of Natural Medicine and it’s physical school The Thai Yoga Center and the NAIC/ SMOCH/ AAPNA, Accredited school of natural and spiritually based healing arts and sciences. 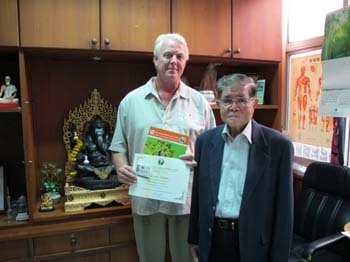 The Thai Yoga Center is a State of Florida DOE compliant degree granting institution. We are also FSBMT/ NCBTMB Category A Approved Providers for Massage Therapy Continuing Education. Aachan, Dr. James is currently volunteering and offering his instructional time free of charge as a public service. This past year (2017) he donated over 60 full and or substantially reduced tuition scholarships to deserving students with plans to offer scholarship training to an additional 100 professional students in (2018). Offering SomaVeda® Thai Yoga, Ayurveda and Yoga Therapy in the Clinton Township, Michigan area!